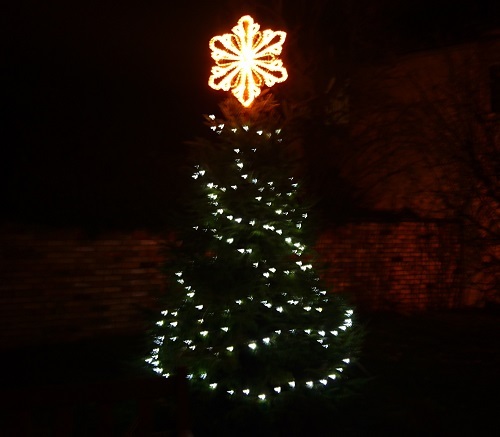 News » Fen Ditton's Christmas tree - now lit up! About 50 people attended the lighting-up event on Wednesday evening. A total of £100.00 was collected for the Church Community Hall restoration fund, which will become £125.00 after Gift Aid has been added. Many thanks to the organising committee and all those who helped on the night, especially Mark Cullen for his electrical wizardry, Lesley Helliar as MC, Lauren Thompson for leading the singing, the church and Geoff Peel for the microphone, Linda Allen for allowing us to use her house and carport, the Parish Council for their financial contribution to the event, Number One Horningsea Road for allowing us to use their electricity, and everyone who parked elsewhere for the duration of the event.